Nearly 700 students from 35 states and 17 countries joined the Gustavus community on Friday, August 31. The Gustie Greeter orientation leaders welcomed the Class of 2022 to campus. On Friday, August 31, an early-morning thunderstorm swept across the Minnesota River valley. It passed over the hilltop campus of Gustavus Adolphus College and ushered in a pleasant late-summer day as the community welcomed nearly 700 members of the Class of 2022. 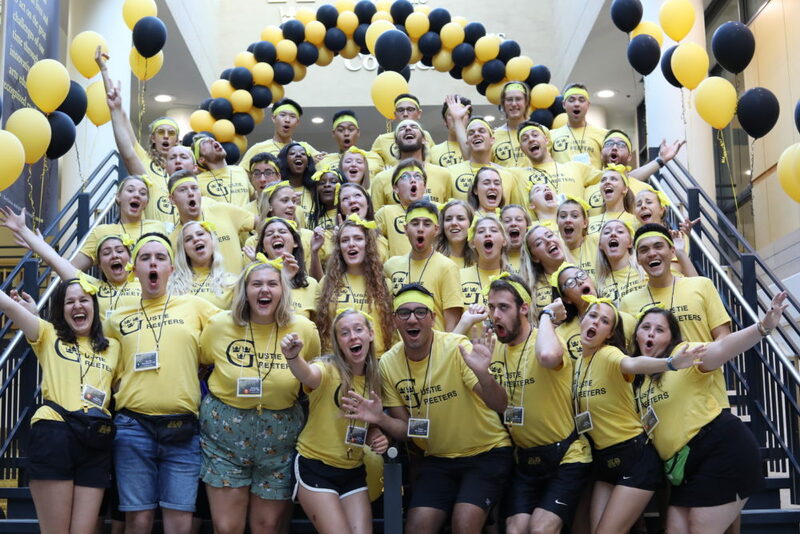 Hailing from 35 states and 17 countries, the new Gusties arrived on campus as Gustie Greeter orientation leaders cheered and waved them on. The students, 22 percent of whom hold a high school GPA of 4.0 or greater, unloaded their cars in front of Pittman, Sohre, or Norelius Hall and were helped into their rooms by the Gustie Move Crew, a new volunteer group of returning students, faculty, and staff. After lugging futons and mini-fridges up flights of stairs, meeting their roommates for the first time, and assembling bed lofts, the Gusties settled in as parents, grandparents, and siblings unpacked totes or were dispatched to the grocery store or nearby Mankato for last-minute provisions. 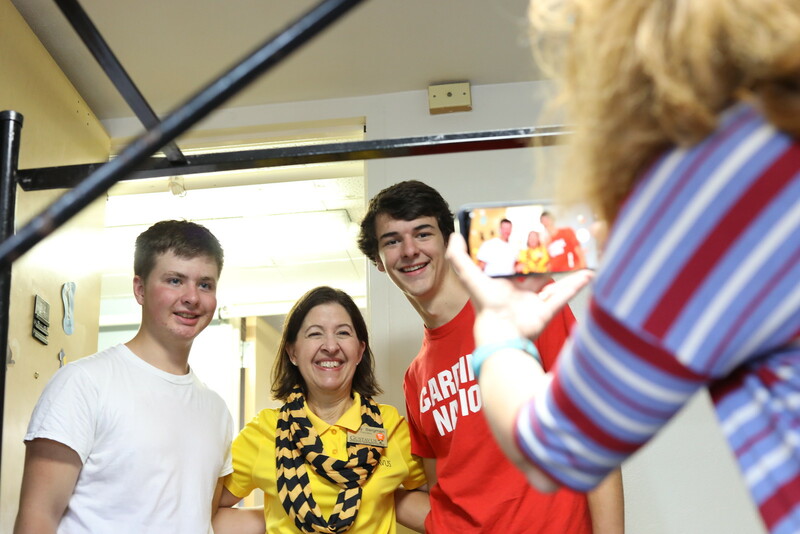 President Rebecca Bergman visited residence halls to greet new Gusties. After lunch in Lund Center, the families descended on Eckman Mall, snapping selfies with President Rebecca Bergman, taking traditional photos at the Gustavus sign on Old Main Hill, and eating ice cream treats provided by the Center for Career Development. Other Gusties took advantage of the afternoon to finish unpacking, explore the campus, or get to know their new classmates. Amid the hustle and bustle of move-in day, first-year student Daniel Wang found a moment of respite in Christ Chapel, where he and his father walked among the pews, taking in the quartz-and-concrete pillars and stained glass accents, before Daniel sat down to play the Steinway piano near the pulpit. “This is a beautiful place,” his father said quietly. An hour later, the chapel was brimming with people as President Bergman was joined by Dean of Admission Richard Aune ’81, Provost Brenda Kelly, Vice President for Student Life JoNes VanHecke ’88, and other members of the community for a convocation service for new students and families. The students, who included fourth-generation Gusties and those who were the first in their family to go to college, rose for a blessing at the conclusion of the service. Christ Chapel was filled with wistful smiles and proud tears as parents, guardians, and families wished their new Gusties well. More Move-In Day photos on Flickr.